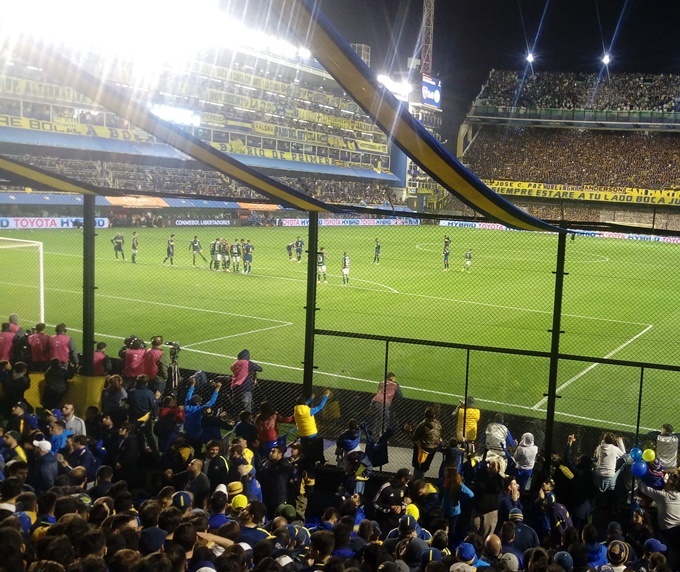 For many football fans, a trip to watch Boca Juniors play amid the famously hubbub at La Bombonera is a bucket list staple. 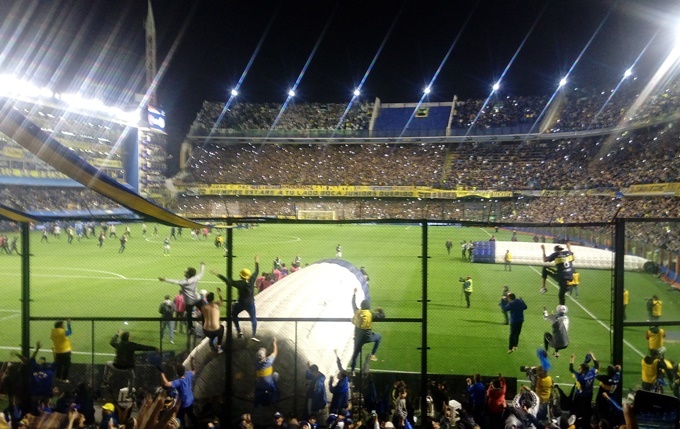 With Boca set to battle primordial rivals River Plate in the grand finale of the Copa Libertadores this weekend, freelance sports journalist Chris Marshall-Bell (@cmbell310) tells us exactly what it’s like to worship among Los Xeneizes’ congregation from within the very bowels of their cacophonous blue and yellow cathedral. Specifically, Marshall-Bell was lucky enough to travel to Buenos Aires and attend Boca’s first-leg semi-final win over Palmeiras which, as you’re about to find out, was quite the experience. To the untrained eye, there is chaos all around. Three stout lines of security and police have been negotiated before entering the ground, and once inside, a bewildering barrage of noise and colour fails to mask the maelstrom of activity. While one fan clambers up the high wire fence that separates him from the pitch to hang yellow and blue steamers, others traverse across walls to hang their banners. In the stand that bears the number 12 (i.e. the “Twelfth Man”), crushes threaten to start, with arms waving about sporadically. Waving, not drowning. Except, of course, to the trained eye, to the Boca Juniors fan, this is all completely normal. The madness, the fervent passion, the acrobatics, the banners proclaiming that “Boca is Life” – hung precariously and somewhat ironically while defying death. This is Argentinian football. This is how it rolls. I had paid the vastly-inflated tourist price of £110 (locals paid around £15) to watch Boca’s Copa Libertadores semi-final first-leg against Palmeiras, managed by former Chelsea coach Luiz Felipe Scolari. 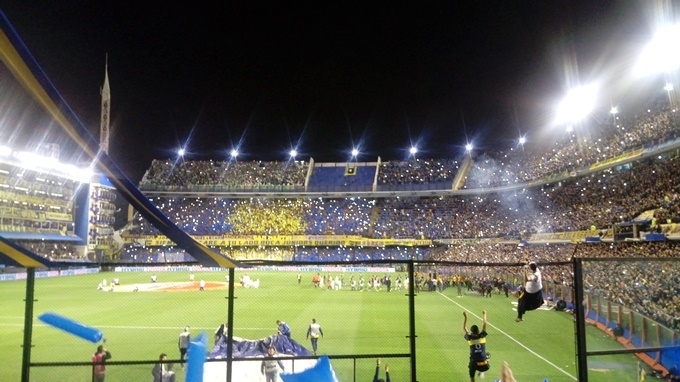 Los Xeneizes, the name attributed to Boca’s fans, are a unique set of supporters. Proud of their working-class upbringing, they cramp into La Bombonera, their iconic, fabled, steep-sided ground, over an hour before kick-off, thus heeding police advice to avoid potential conflict outside. The atmosphere is electric, their catchy, go-to song “Dale Dale Boca” getting a rousing rendition every five minutes. 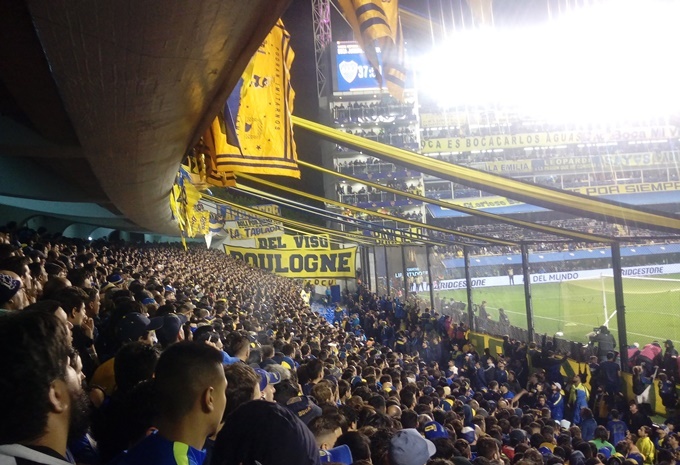 Banners are ubiquitous in South American football, and one defiantly claims “Boca is the Big One”, a reference to River Plate’s claim to be “El Mas Grande” – The Biggest. Not here, they’re not. Another flag features the ardent declaration “I will always be at your side, Boca Juniors”. The game begins scrappily, Palmeiras succeeding in their damage limitation ploy. Still, though, Boca’s fans don’t quieten or sit still for a second, their collective rhythmic bouncing making it appear as if each block of concrete up in the terraces is dampened with springs discarded from a local trampoline factory. Each hymn in this mythical church of football gets a lengthy performance and the singing spreads right around the ground like an infection virus. So too does the pogo-ing, creating a synchronised wave. The beating heart. Down at the bottom, a smattering of around 50 fans have their backs turned to their game; their role is to play orchestra, leading their respective three tiers through a vast repertoire of chants. 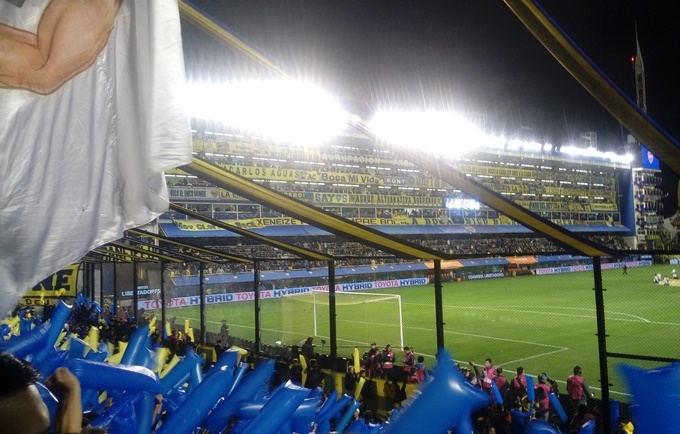 The singing in the first half is only punctured once, when everyone in the lower tier bows their heads to witness a two-man brawl, as two Boca fans – one fulfilling the hooligan archetype with shirt long since disposed of – begin trading blows. It lasts barely 10 seconds after flaring, but it is a telling reminder just why Argentina has such a unrelenting problem with fan violence. It’s little wonder away fans have been banned from attending matches since 2013 when home fans can’t be prevented from fighting among themselves. A goalless, uneventful first half gives way to a markedly improved second period. It is Uruguayan midfielder Nahitan Nandez who is doing all the creating for Boca, eliciting a roar of anticipation and excitement from the crowd with almost every touch. A fan behind me, resplendent in Azul y Oro, seems to have grown affectionate with my shoulder, for whenever Nandez gets on the ball and approaches the final third, he grips me, ready to use my entire body as a fulcrum to leap up off the terraces should his beloved Boca score. The impasse isn’t broken, however, until fan favourite Dario Benedetto appears off the bench. Injured for nine months thus scuppering his hopes of appearing at the 2018 World Cup, the striker soon powers Boca in front – his header causing a seismic reaction in the ground, with footage on social media showing one concourse’s roof lifting up off the beams it was supposed to be resting on. Down around me, bodies are strewn everywhere; limbs jut and flail out in awkward directions. There’s been a crush. An “avalanche”, as one fan describes it. Perpetual motion. It’s like a children’s ball pit with half the kids are sucked under the surface, with only stray heads and arms bobbing above. Fans who are above the plimsoll line kiss one another. There’s been no implementation of the Taylor Report here. Not even a hint of it! Order is restored in time, but it’s not long before all hell breaks loose again. Benedetto – whose shot accuracy is so deadly that he would make a champion spear fisherman – pivots on the ball 20 yards from goal, jinks rapidly onto his favoured right foot and shoots low to give Boca a two-goal advantage. The game ends 2-0, but fans are in no hurry to exit. For 15 minutes after the whistle, the stadium remains at maximum capacity, with fans shinning up the fence under the watchful eye of disapproving riot police, while the more obedient continue to jump and sing as the clock ticks ever closer to midnight. Boca subsequently advanced to the final after a 2-2 draw in the second-leg in Brazil, setting up the hotly-anticipated final with River. In the preceding days, TV coverage in Argentina has exclusively been about the Superclasico. Away fans are banned from attending both games, but even without their presence, the onslaught of noise, colour and naked emotion could well be something never before witnessed in football. We’ll find out on Saturday night! Chris Marshall-Bell (@cmbell310) is a freelance sports and travel journalist. He’s reported on over 100 football matches in England’s top five leagues for a variety of publications. Specialising in cycling, he has covered three Tours de France. If it’s not sport he’s reporting on then he’ll be writing travel reviews for specialist magazines and international publication. It’s difficult to get in, difficult to get out, you might be mistakenly beaten up to death, the center of the attention is usually the referee instead of the football itself and the sold out crowds that you see are only against River Plate, 2 or 3 times per year. But… if you’re in Buenos Aires, it’s something to do. Just don’t come here only to see a game, there are better things to do with hard earned money.